Our recently updated 2,000 square foot, canal-front Siesta Key, Florida home with 2 bedrooms and 2.5 bathrooms is roomy and tastefully furnished. The luxurious master bedroom has a private Jacuzzi bath tub, a large bathroom, queen bed, walk-in closet and a private courtyard. The second bedroom, also with a private bath, contains twin beds as well as a trundle bed. Drop-in guests can be comfortable with the family room's queen sleep sofa and the 1/2 bath off the kitchen. Meals are enjoyed in either the spacious dining room or at the large breakfast bar. The roomy kitchen with two separate sinks, makes cooperative meal preparation a breeze. Enjoy watching TV on the two recliners in the television nook. The home's spacious feel is enhanced by the family room's large leather sofas, cathedral ceiling and wood burning fireplace. The house has recessed lighting and Mexican tile for a wonderful ambiance. Swim in the 25' by 16' private pool with new patio furniture or fish off the seawall. 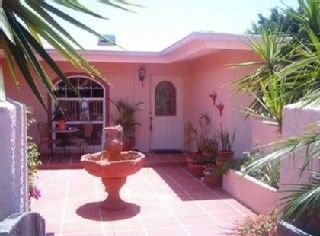 The house is in a prime location...just a two minute walk to Siesta Village and a 5-minute walk to Crescent Beach. The gentle tropical breezes rolling off the Gulf of Mexico make Siesta Key the perfect year round vacation spot for world travelers, active seniors, families with children, and honeymooners too. Our home is located in a quiet residential neighborhood. The short street ends in a cul-de-sac which results in little traffic. Siesta Village, with a wide selection of restaurants, nightlife, ice cream parlors and shops is only steps away. The beach is just a few more steps away! Siesta Key, Sarasota is located on a barrier island on the Gulf of Mexico and is world famous for a white quartz beach that remains cool on the feet, no matter how high the thermometer rises. The area is wonderful for collecting sand dollars and shells. Tampa Busch Gardens is a one hour drive and Orlando attractions are 1 hour and 45 minutes away. Beautiful home pictures don't do it justice. Plenty of room for a large family. Master Bedroom is on the other side of house with its own private patio connecting to the pool. Pool is fantastic for those hot and humid days and nights. Canal right out back had some visitors, Manatees with a baby very fun to watch, bring your fishing pole saw lots of fish. Home is very well stocked with linens and towels and the kitchen has everything you need. BBQ grill on the side of the house can be brought around to the pool deck to cook and swim.. Great place to entertain. The Village and its bars and restaurants are steps away just be careful you will find yourself overdosing on seafood. Very hard home to leave. Make sure you look through the blue binder in the entry it has menus and maps and suggestion for the whole area. The beaches are just a couple blocks away easy to walk to and the best sand in the world. Owners very friendly and respond quickly if you have any question about your stay. When I am tired of our midwest winters I will make sure to rent this home again. This house was perfect! Very convenient to walk to shops or restaurants as well as the beach! The pool is clean and the patio furniture is comfortable. We spent the majority of our days poolside, so content there and loved looking for fish and manatee in the canal. The kitchen has everything you could need(except the food :) ) as does every other room-sheets, towels, and even beach towels were all provided. I highly recommend Siesta Bliss and would definitely stay there again….like I plan on doing next year! Great Week in Siesta Key! We really enjoyed our stay. The home was very clean, cozy and well stocked. Very comfortable furniture and beds. The pool was amazing and you absolutely cannot beat the location! We would definitely love to rent this home again. Just a few things that would make it even better. We would have love an umbrella by the pool and maybe a few bikes. Aside from that it was really lovely! We had a great stay the house had everything you would want. We walked on the beach every morning then we come back to the house to have breakfast by the pool. This is a great location you can walk to everything and Dave has thought of everything. Any question that you could have is already answered in a book he has provided. The only bad thing about the stay was that we could not longer. We hated to leave. This home is perfect. 5 min walk to down town..right on the canal. Pool was clean and cool Perfect for sunny afternoons. The house was spotless and oh so comfortable. The housekeeper Anna was a delight to meet when we arrived early. The owner Dave was so amiable and easy to talk with as we had a delayed flight and he allowed us to keep our bags at the house until the next guests arrived. I would highly recommend this home the price is right and the location is perfect. We swam, boated, and biked all over siesta Key. We were able to park our rental boat right at the house. I would stay here again and stay two weeks instead of 1!!! thanks you Dave for everything. Oh and there is a great book w/all sorts of information about the house and restaurants in the area.